The Hyundai Group is seeking approval from the government for a visit by executives to Mt. Kumgang for a memorial service for its late chairman Chung Mong-hun, who developed the mountain resort in North Korea. Hyundai, which is a different branch of the Hyundai empire from the better-known carmaker, will submit an application to the Unification Ministry next week to visit the North in time for the 15th anniversary of Chung's death on Aug. 4, according to a company spokesman on Tuesday. 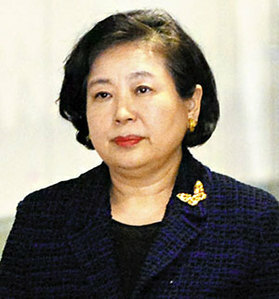 The company has held a memorial service at the mountain resort every year since Chung, the husband of current Hyundai Group chairwoman Hyun Jeong-eun, jumped to his death amid a corruption probe in 2003. A memorial stone stands at Mt. Kumgang in memory of Chung, who led South Korea's economic cooperation projects in the heady days of the Sunshine Policy. Package tours to the resort came to a halt after a South Korean tourist was shot dead by a North Korean guard there in 2008. "We hope that there'll be talks about resuming economic cooperation projects, including package tours to Mt. Kumgang, once we visit," a Hyundai executive said. Back in May, it launched a task force led by Hyun to prepare for the resumption of tours as tension was easing after the inter-Korean summit. Some staffers of Hyundai Asan, the tour operator subsidiary, have been in the North since Monday to repair a meeting hall in the mountain resort.